World Premiere: Court Theater, Munich, Protected content . 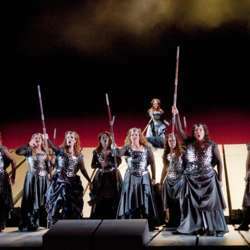 The second opera in Wagner’s monumental Ring cycle, Die Walküre has long stood on its own as an evening of extraordinarily powerful theater. Part of this appeal lies in its focus on some of the Ring’s most interesting characters at decisive moments of their lives: Wotan, the leader of the gods; his wife, Fricka; his twin offspring, Siegmund and Sieglinde; and, above all, Wotan’s warrior daughter Brünnhilde. These characters and others follow their destinies to some of Wagner’s most remarkable music. This if you allow me is an Opera that unless you love Opera will not recommend you to attend as Wagner Opera's are "maybe" too dense and long for "Opera beginners" and definitely not suitable to be your first Opera. Please remember to come prepared with warm clothes as inside the AN will be chilly and you will be seated for almost 5 hours. Looking forward to enjoy this performance with those braves who attended!